The true cost of kittens! National Volunteers Week 1 - 7 June! Cats Protection has launched a campaign calling for change in the law to protect young kittens from being sold sick and underage. 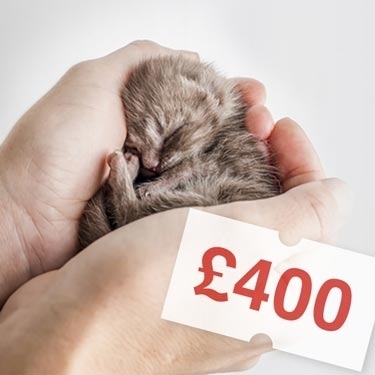 'The True Cost of Kittens' campaign has been created in response to a growing, commercial market resulting in kittens being bred in poor welfare conditions being sold and landing new owners with hefty vet bills when the poor little creatures become ill. It calls for urgent action to update the law on pet sales and clamp down on those who put money before basic welfare. There have always been individuals prepared to cash-in on the appeal of kittens, it is the growth of the internet and social media that has made access to kittens quicker and easier than ever before. All too often, unsuspecting purchasers buy kittens which are sick and, in many cases, younger than eight weeks old – the minimum age at which they’re ready to leave their mother. The result can be significant suffering for the kitten and hefty vet bills for the owner, which can be emotionally and financially draining. In some cases, the kittens may not survive. provide a clear definition of commercial pet sales to protect the welfare of cats and kittens. If you’d like to get involved with the campaign, click here to sign the e-petition. You can follow the campaign on Twitter by clicking here.